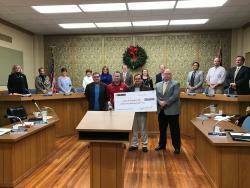 Zanesville, OH – A $25,000 grant from the Nestlé Purina PetCare Foundation is giving local dog owners something to cheer about. The money will be used by the City of Zanesville and “Friends of Riverside Dogzville” to improve the city’s new dog park by installing water fountains, pathways, agility units, benches, and shelter. The dog park originally opened in October 2016, and the new features are expected to be added by late Spring 2017. The dog park is 2.6 acres in size, and is split into different areas for large and small dogs. Nestlé Purina also values its longtime partnership with other area organizations, like the Animal Shelter Society, United Way, Christ’s Table, Salvation Army, Zanesville Civic League, & Big Brothers/Big Sisters.